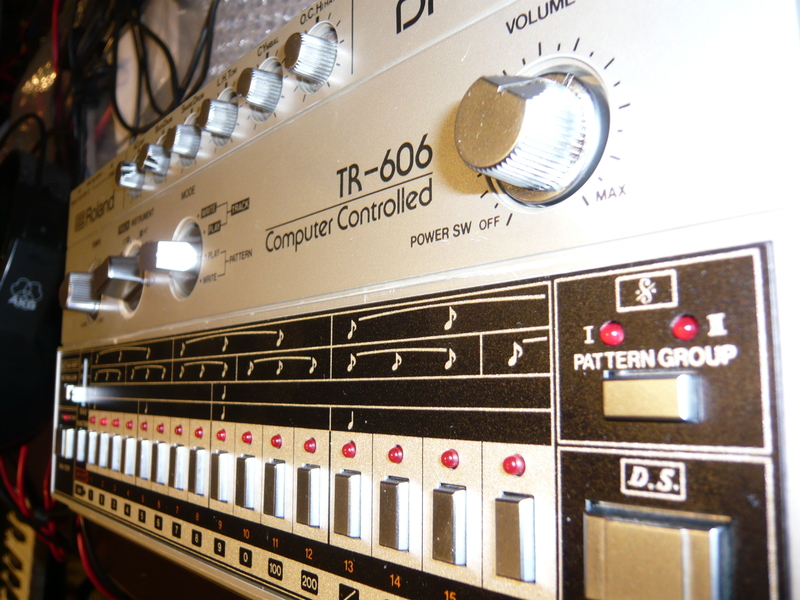 This TR-606 had a problem with the power supply, somehow it would play erratic tunes and reset itself when both the batteries and the DC-plug were inserted. So what’s wrong with this thing? A quick look at the circuit diagram reveals that there’s a power transistor (Q42) in the circuit which handles the DC supply and that GND should be different from the ground potential supplied by the DC plug. 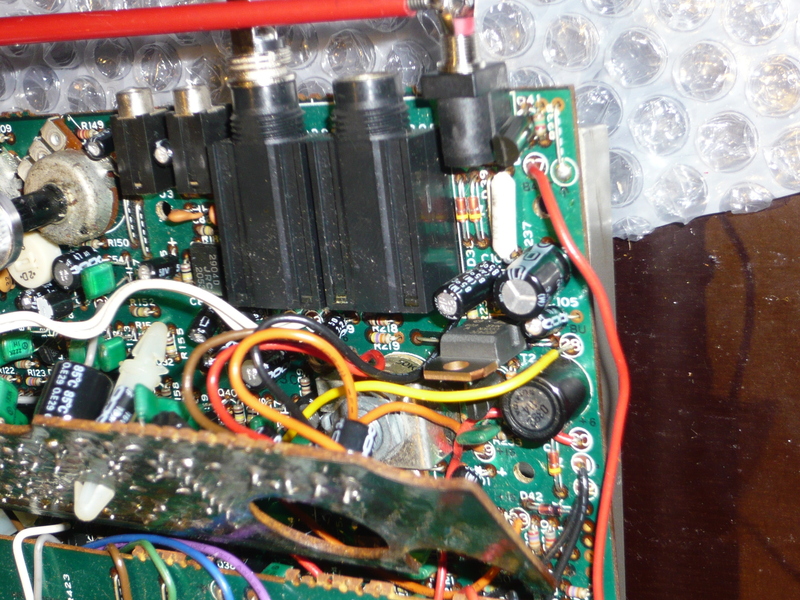 Aha, somebody already ‘fixed’ this unit… hmm, and the power transitor looks somewhat… green? Seems to have overheated quite a bit! 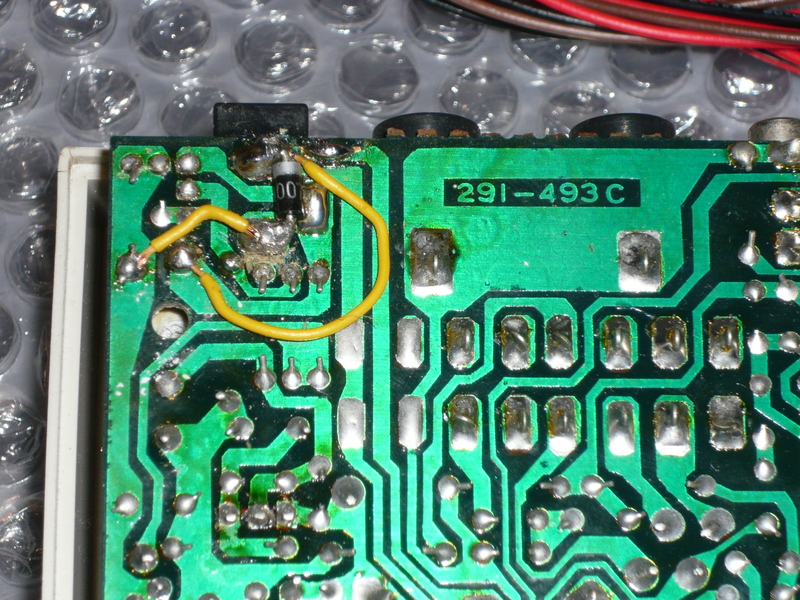 Unsoldered it and a tested as defective. 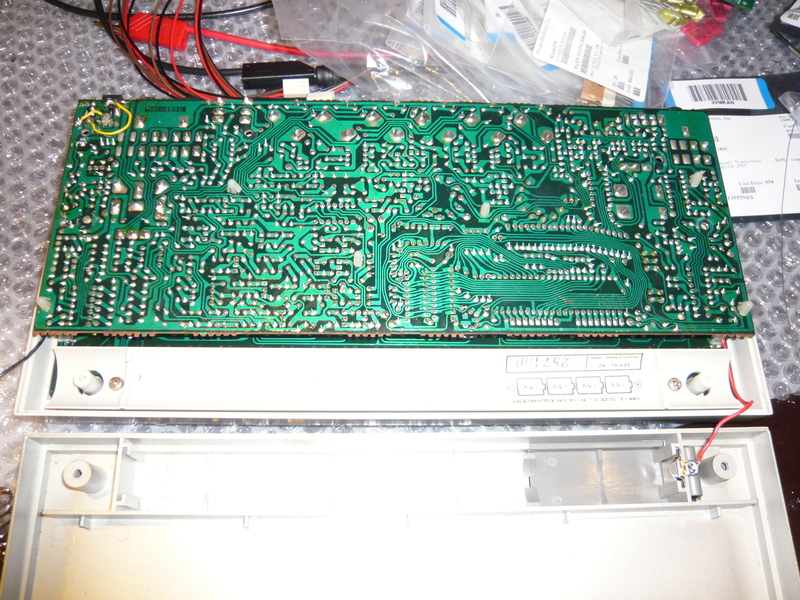 I have replaced it with a BD242b, direct pin to pin replacement. 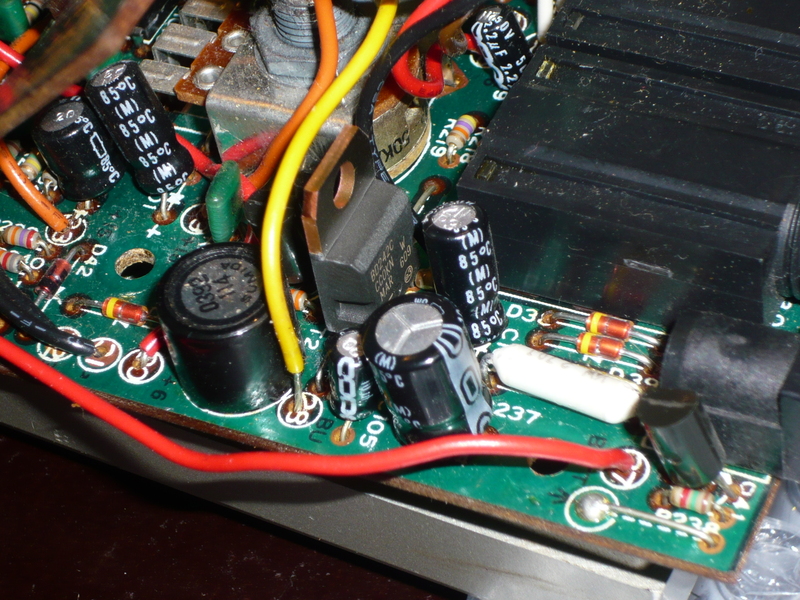 Seems like the capacitors around that transistor have suffered from the heat as well so I exchanged them too. I wonder what this previous ‘repair’ attempt has been good for? I can only speculate, but it was either to circumvent the fact that the power transistor had gone bad, maybe using a wrong power supply with a wrong polarity or that the previous owner needed to have the units power supply GND at the same GND level as the instruments output… but I’ll probably never know the true story. Hey, now it is working again, nice! So next on the list is the replacement of the buttons, some of them which only respond under a lot of pressure. I decided to exchange all of them in order to provide a consistent feel on all the buttons. Ok, last but not least, I discovered that the DC socket has a bad internal switch, which means that in battery mode, the unit sometimes behaves like if the batteries were already empty. Fortunately, this socket is a standard size so I easily found a replacement, after which the units works like new again. So, now everything reassembled and tested, everything’s good again! 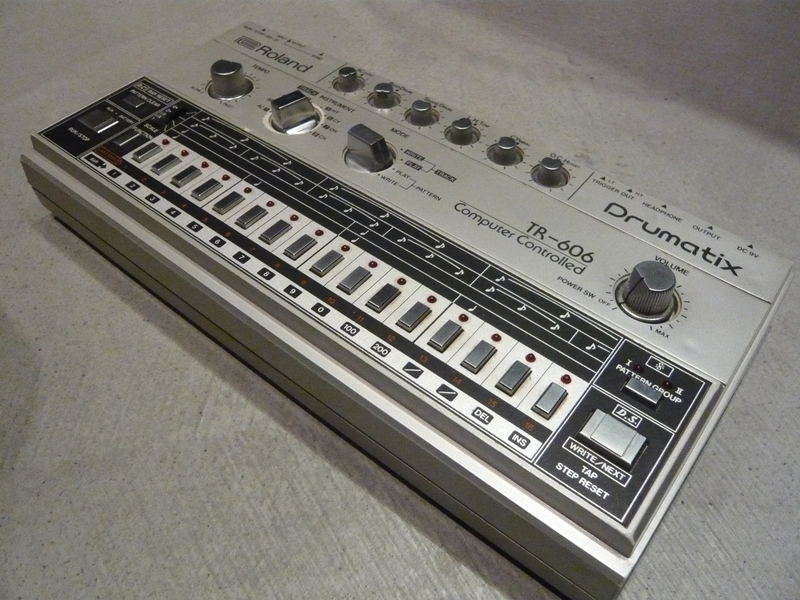 In this particular case, it turned out that the 606 was not really completely operational, in battery mode it would eventually skip beats and also the instrument volume was different between battery and dc plug mode. 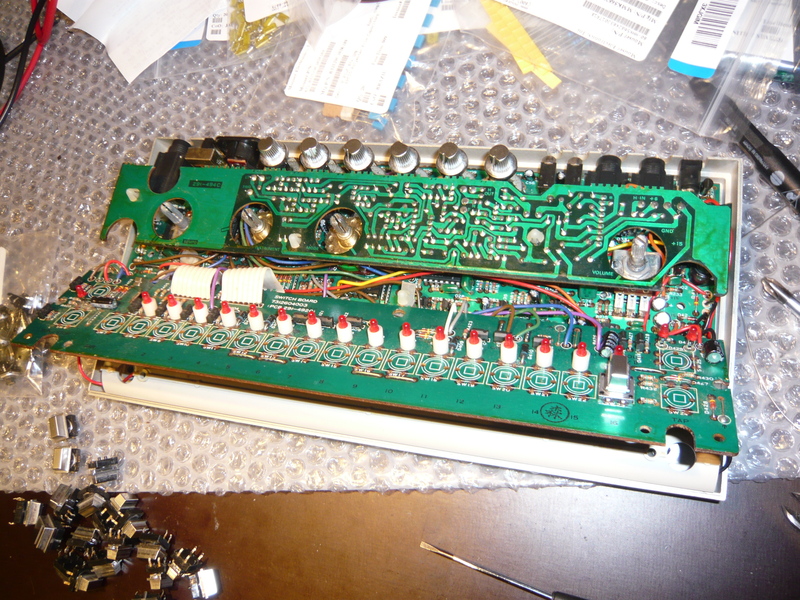 As well, the led’s on the frontpanel were dimmer in battery mode. Taking a second look at the power supply circuit, i found a 1V difference between input of transistor Q41 (responsible for dc-plug polarity inversion protection) and it’s output, with the result that the 6V supply line was really somewhere around 5.2V. In reality this voltage drop shouldn’t be more than 0.2V. 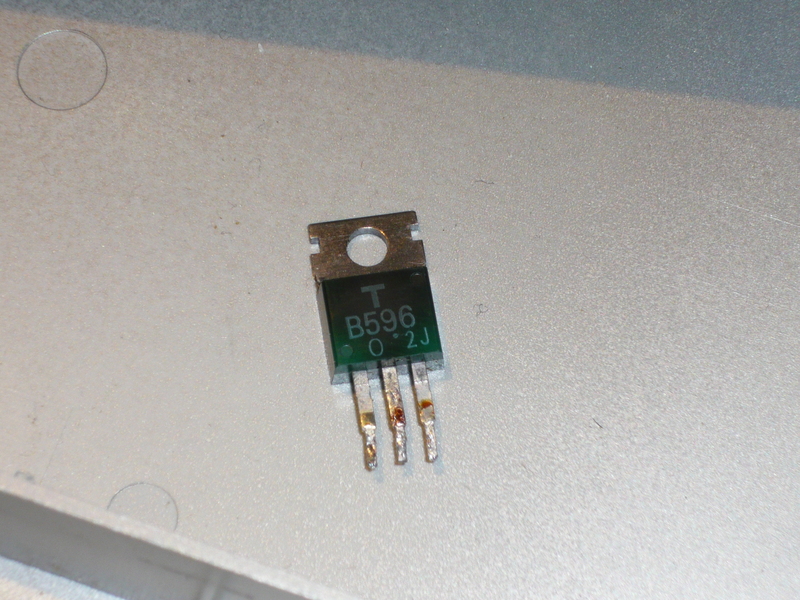 Furthermore, this transistor showed some ill behavior when touching it, with it’s collector voltage drifting away. I concluded that I should replace it and see if that’s causing the trouble. In fact, the original 2SB647C is unavailable nowadays, but any medium power pnp should do here, so I replaced it with an BC640 with an equivalent pinout. This actually did the trick and the voltage went back to the defined value. Now there is hardly any difference between DC-plugged and battery mode and I suppose that the initial power supply modification by the previous owner which destroyed already Q42 has also been responsible frying Q41. 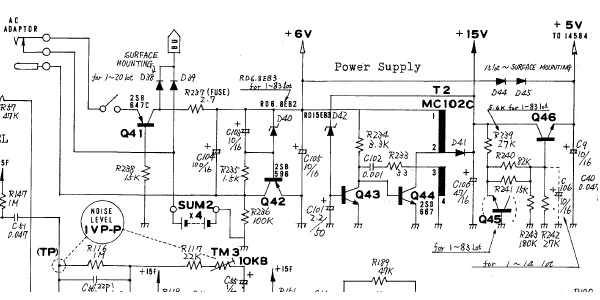 By the way, I found a typo in the TR-606 service manual, in the schematic of the power supply, resistor R238 should say 1.5K as a value instead of 15K as it is noted on the schematic.